Its been a while and a lot has happened over the last few months. Of particular note is that the Cloudrouter.org team at IIX launched their public beta on the 31st of March! Head over to https://cloudrouter.org/ to check out the latest on the project. 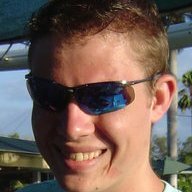 For those of you this side of the ditch, I have created a quick script to drag a copy of the repository to Brisbane. Your mirror link is http://repo.cycloptivity.net/cloudrouter.org/. Personally, I plan in letting a few of these routers loose in DN42 over the coming months! While using just a few nodes for DN42 has been I thought for fun I would deploy a few more POP’s around the world (The HE IPv6 video on sparse allocation might have helped!). As such I introduce a number of new changes. I’ve extended my dn42.cycloptivity.net sub domain to include a country code for each node. My residential crappy ADSL2+ tail with routing via Ubiquiti EdgeRouter Lite. Currently blazes at 6/0.8Mbps. Eventually will move to a FTTH 100/40 service and host AU services for DN42. In the meantime au01.dn42.cycloptivity.net will no longer provide transit. Future nodes may include a Cisco 877 and Juniper SRX110 once bandwidth improves. remarks:   VYOS peering from Binary Lane Brisbane, AU. remarks:   VYOS peering from VULTR Tokyo, JP. descr:     VYOS peering from VULTR Sillicon Valley, US. descr:     VYOS peering from VULTR Frankfurt, DE. Currently the last remaining POP to go live will be jp01. All other nodes are already alive and able to provide transit (albeit sub-optimal in some cases). At this time all nodes are providing IPv4 only. Native IPv6 is planned next. I’ve created a brief diagram showing average RTT between each node. I am starting to make use of the phpipam tool to track address usage. Hopefully, I can make use of the phpipam API to create a automatic rdns tool. Tracking all the various interfaces is getting fairly tedious! Thats all for now! If your interested in this sort of shenanigans please visit dn42.net! Its not quite the next blog post that I promised but what the heck. 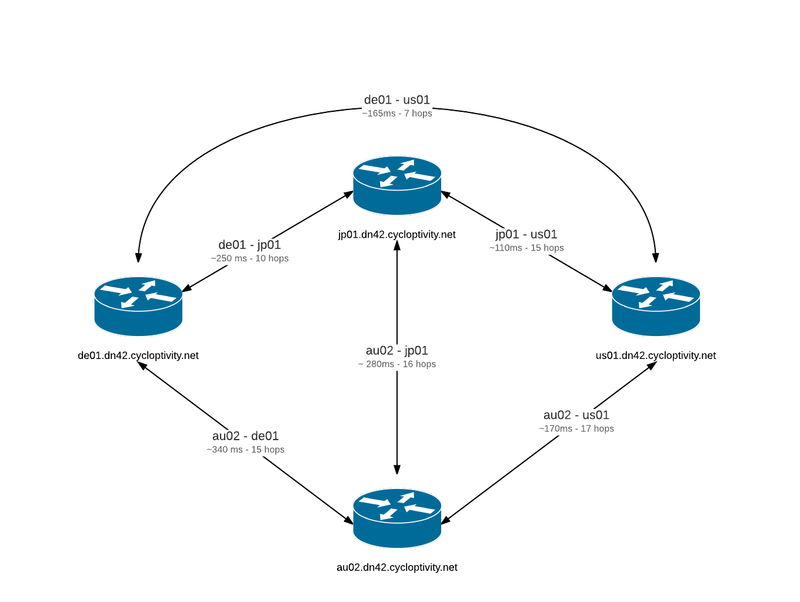 Today we are talking about my recent experiences in peering VyOS into DN42 via OpenVPN. This should help you to form site-to-site tunnels using OpenVPN! First we need to generate a PSK to exchange with our peer. Also note that on VyOS you need to store keys in /config/auth/ or suffer key loss during image updates. After sharing the pre-shared key with your peer we move onto config. Your peer will likely be running OpenVPN and actually using its config file syntax. Take this file for example. Now we can convert to VyOS configuration statements. VyOS seems to expose most of the more arcane OpenVPN configuration statements via the set interfaces openvpn vtun1 openvpn-option command, so you should be able to match your peers configuration. By default VyOS will run the OpenVPN processes with a --ping 10 --ping-restart 60 so you can omit that. Once configured you can run show openvpn site-to-site status to view your tunnels! I have now provisioned a dedicated VPS with Binarylane in the NEXTDC B1 facility. From here we have a good place for DN42 transit until I am eventually connected to the NBN. Those that are interested, please feel free to traceroute dn42.cycloptivity.net. Good luck and happy peering! I have recently stumbled across DN42 and have been fairly excited to transition my networking know how from layer 3 meshing via OLSR (back in the NTFreenet days) to now understanding more of complex enterprise networks. And so with this in place I introduce my humble home lab. And finally some 11 clients between wired clients, mobile clients and media devices. Things a pretty boring here. You can see most of the detail already in the picture at the start of this post. None the less here is the documentation for my benifit. I have not really found a cleaner way for this short of tables so you will have to suffer through or suggest a better alternative! In the next installment we will describe the layer 3 networks! Heres a short post for today. A while back I remember being very excited to see that asciiflow.com had updated their platform and the tool had become far richer. What I did not realise at the time was that the source code which once use to be available had vanished from the internet (aka github). I am not exactly sure what the motivation for this would be since its either a thinly veiled attempt to siphon up technical details from those less security concious or just a plain change of heart. Either way it left me feeling fairly disappointed in the project. After being faced with the need to document things quickly and in an ever changing way I went on the hunt for a replacement to asciiflow and I found asciio lurking in the Fedora repositories. I’ve been using asciio now for a few weeks and can say that this application is simply awesome! A GTK interface to interact with layer based ascii diagrams is exactly what I was after. Most particularly I can be confident that these documents stay with me and my /dev/sda. There is mostly undocumented feature in the save and save as function. That being the all documents saved with .txt extension are NOT able to be loaded as these are the ascii exports. To save a document to reuse give it another extension. Personally I have used .asciio to keep things obvious and not had any future trouble. Details are in BZ1097538.